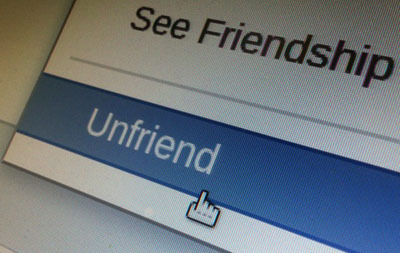 The unfriend button is taking a pounding as political rage spreads like wildfire on social media, a networking and privacy firm said. A survey for Comparitech found that nearly 52 percent of social media users have wiped friends over political arguments. Overall, 44 percent unfriended somebody with opposite political opinions. The survey found that Democrats are 47 percent more likely than Republicans to express their political views on Twitter. Comparitech said 38 percent of Democrats said they were more likely to post on social media in the wake of the 2016 election, while less than a quarter of both Independents and Republicans felt the same. Democrats are 38 percent more likely than Republicans to post about social issues, while Republicans are nearly three times more likely to express their views about national security on social media, the survey found.